Of course the quality of the opposition must be taken into account. Of course Leinster teams can only judge themselves on performances against teams from outside the province. Or so the theory goes anyway. And of course it’s the first Sunday of February. But days like today are so rare for the Kildare supporter we’ll beg forgiveness for wallowing just a little in a ten point crushing of neighbours Meath in their own backyard. Particularly when you think of the dark days endured by the players and fans these past few years. The hyperbole over a pre-season defeat to Dublin’s development team can now surely be put to bed, ridiculous as it was. This was the one that mattered and Cian O’Neill and the Kildare management team can take a clap on the back for having the team ready for the right game. So how good was this? You’d have to go back to Thurles in July 2015 for the last performance of a similar standard, a night when Cork were put to the sword and players like Paul Cribbin and Niall Kelly delivered on the promise they’d shown since underage. There’d been nothing to match it in between, perhaps the league win against Tipperary last spring coming closest. Cribbin and Kelly were sensational in Navan today. Kildare played some wonderful football, particularly in the opening 25 minutes, when Meath had no answer to their crisp handling, movement and skillful foot passing into a lively full forward line. Dominant at midfield and seemingly able to penetrate the Meath half-back line at will, the chances kept coming and by and large the forward line took them. I can’t recall an earlier Lilywhite goal than the one Ben McCormack tucked away after 15 seconds. The game’s outstanding midfielder Kevin Feely fielded the throw-in and found Cribbin in space. It looked like he might go for a long range point but instead delightfully found McCormack wheeling inside his marker Donal Keogan and the Sarsfields youngster buried the chance in the bottom corner on his league debut. Daniel Flynn then swung over a wonder point from the right hand side and the excellent younger Cribbin brother made it 1-2 to 0-0 within 4 minutes as Kildare sauntered unimpeded through the Meath rearguard to the shock of the silenced home crowd. Donal Lenihan got Meath off the mark but McCormack, Keith Cribbin, Feely and Kelly further troubled the scoreboard operator before a Lenihan free for the Royals. Only 10 minutes gone and Kildare were in dreamland with a 1-5 to 0-2 lead. Meath were struggling to make any headway at all. Their football was “agricultural” to put it mildly, their tactics consisting of direct running into a wall of hard-working defenders or long balls into a somewhat isolated full forward in Brian Sheridan. Nothing was working, and the number of fumbles and mis-placed passes frustrated the impatient home crowd. The scoring slowed down somewhat but Paul Cribbin was on target again to stretch Kildare’s lead to 7 points. Meath lost corner back Mickey Burke to a black card on 19 minutes and two minutes later had a good shout for a penalty (or at least a free) turned down. Cillian O’Sullivan shrugging off a difficult opening quarter when the ball just wouldn’t stick to his hands, made a burst towards goal and was surely fouled but referee Ciaran Branagan kindly waved play on. A minute later down the other end Paul Cribbin was setting up a second goal, this time finding Kelly in space. As is becoming customary the classy Athy forward found the net with aplomb. Kildare could have closed the game out completely when Daniel Flynn slalomed along the end line and when he found himself in front of goal had two attempts to find the net, the second cleared off the line. Flynn’s pace scared the living daylights out of the Meath defence whenever he was on the ball. Debates rage about his best position but let’s enjoy having him on the field. To be fair to the home side, their heads didn’t drop and they embarked on a typically Meath-like rally between then and half-time, rattling off five points with captain Graham Reilly much to the fore. The St.Colmcille’s man, taking time out from the club’s run to the All Ireland Intermediate final, scored four points from play on the day and looked as dangerous as ever when in possession. O’Sullivan, Lenihan (two) and Brian Power were also on target as Meath clawed the deficit back to six points at the break. It could have been so much better for the Royals though as O’Sullivan was denied by a magnificent block from Kildare keeper Mark Donnellan right on half-time. What a goal would have done to Meath’s (and Kildare’s) confidence at that juncture. Anyone with even a passing knowledge of Kildare football would have known that this game was far from over. Indeed the momentum seemed to be all with the Royal county and you genuinely felt for the mental state of the players in white if they managed to cough this one up. The opening period of the second half was competitive and Meath were right back in the hunt when Lenihan and Reilly pointed to narrow the gap to just four points. But Kildare are developing a real leader in centre-back Eoin Doyle. The Naas man is making the no. 6 position his own and has been outstanding in pre-season. When the chips were going down it was Doyle who ventured forward to finish a good move with a Glen Ryan-esque point to ease the nerves somewhat. 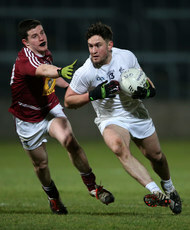 Cribbin followed that up and Kildare’s confidence was growing again. The game was a real ding-dong end-to-end affair at this stage though with neither dominant. Reilly brought Meath back to 5 points down again but a shattering blow was coming for the men in green. On 48 minutes Fergal Conway bull-dozed through on the right and when the ball eventually found it’s way to Kelly in front of the post he hammered another goal past Jack Hannigan to effectively cement the Kildare win. That made it four goals for the season already for Kelly. From there to the end Kildare were relatively comfortable and while Meath kept plugging away they didn’t ever look like making significant inroads into the lead. Substitute Ruairi O Coileain had an effort turned onto the post and out for a 45 by Mick O’Grady but equally Neil Flynn probably should have goaled for Kildare when he was on the end of a 3 versus 2 break but ran out of room with the goal at his mercy. The Maynooth man did have the consolation of a couple of points from frees while the impressive McCormack took advantage of the increasing space in the Meath defence to score two more from play to bring his impressive tally to 1-3. Kelly also scored again as did the flying wing back Keith Cribbin, and Kildare’s scoring was completed by the lively Ollie Lyons who capped an enterprising performance with the game’s last point in injury time. On to Cork now in Newbridge and Kildare sit on top of Division Two after one series of games. A huge test ahead but we could scarcely have imagined going into it with anything like the confidence this win should engender. Kildare are notoriously bad at putting two such performances together but with Cork spluttering somewhat in their draw with Galway a real opportunity has opened up and we should be looking upwards. Mark Donnellan; Mick O’Grady, David Hyland, Ollie Lyons 0-1; Johnny Byrne, Eoin Doyle 0-1, Keith Cribbin 0-2; Kevin Feely 0-1, Tommy Moolick; Fergal Conway, Niall Kelly 2-2, Paul Cribbin 0-3; Neil Flynn 0-3 (2f), Daniel Flynn 0-1, Ben McCormack 1-3. Subs: Cathal McNally (for Conway, 60), Peter Kelly (for O’Grady 62), Shea Ryan (for Byrne 65), Eamon Callaghan (for N Kelly 67), David Slattery (for McCormack 68), Conor Hartley (for D Flynn 68).